This is not something I thought up at all. This idea has been around for ages but when my husband had to run to Home Depot for something else I asked him to grab us some nuts and bolts. 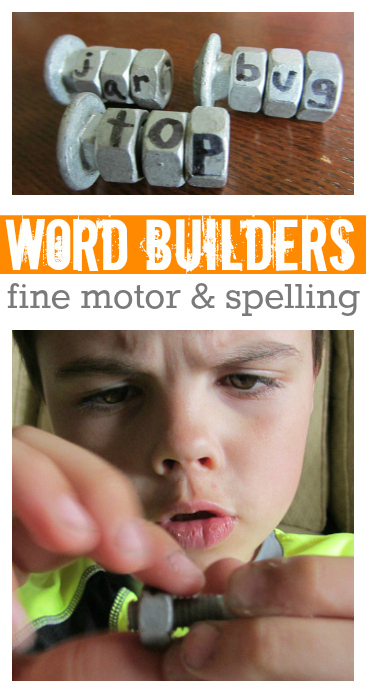 If you are a regular reader you may know that I am forever trying to get my son to work on his fine motor skills. The way I approach this is to mix them with a task he really likes and excels at. For him that is anything language related like reading or spelling. There are way fancier tutorials out there but I am a busy mom so I needed to make this activity quickly . It’s bare bones but it works. Gather your materials. You will need bolts, nuts and a sharpie. A fine tip one would be best but mine was dried out and I’d already told my son we were doing a project so I used my huge one. 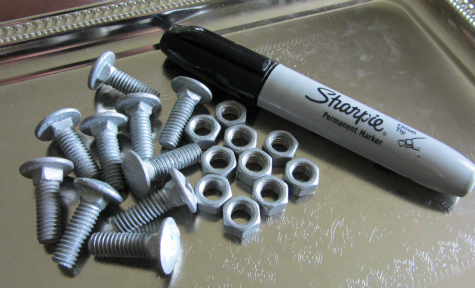 Also my nuts and bolts are matte not glossy which makes the sharpie stay on better. Please test yours out to make sure it adheres before playing. 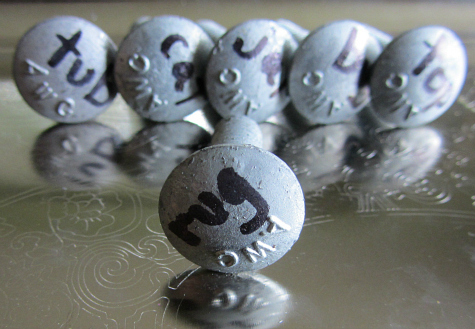 Write out simple CVC ( consonant vowel consonant) words on the end of the bolt. We did cat, rug, tub, top, jar and bug. This could easily be adapted for younger children by writing uppercase letters on the bolt and matching lowercase ones on the bolts. Write the letters on the bolt. 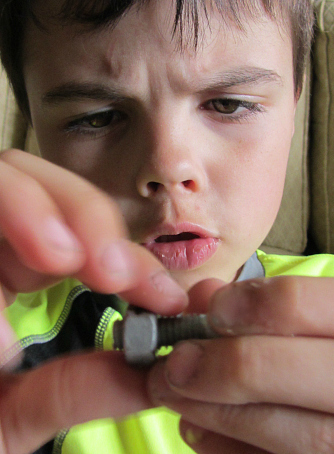 You can chose to only use a handful of bolts and make your child take them off one bolt to use on another word or make multiple copies of the same letter on different nuts. I decided only one copy of each letter because I was trying my hardest to get my son to work his fingers putting the nuts on and off. Invite your word builder and go for it. The first thing he said to me was ‘ How about we do this together. I will do the spelling, find the letters and you can screw them on. ” Nice try buddy. No. Don’t forget to put the letters on right side up. You must pay attention to which way they are on or your bug will look like bng … my son had to unscrew , flip it and screw it back on. Soon he had the hang of it and I felt good knowing he was working on his fine motor skills. He told me the words were too easy so I am going to get longer bolts and give him a bigger challenge soon. After he was done his sister decided she wanted to try. 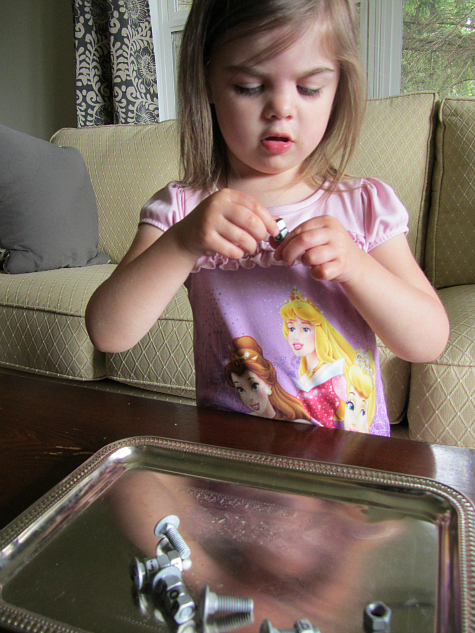 This was really tricky ( near impossible) for her which means you will see some preschool fine motor posts in the near future! 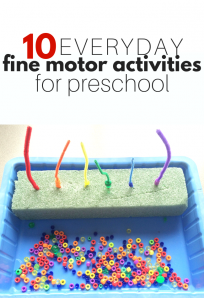 If you want to see more check this round up of fine motor activities out. I think this is brilliant. It reminds me of an activity I did with some kids in my class many years ago. 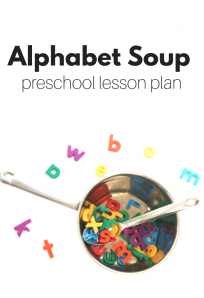 I was teach kdg and had a group of really active, difficult boys. My graduate school adviser at the time told me to find old typewriters and clocks and stuff and to give the boys screwdrivers and let them take them apart. 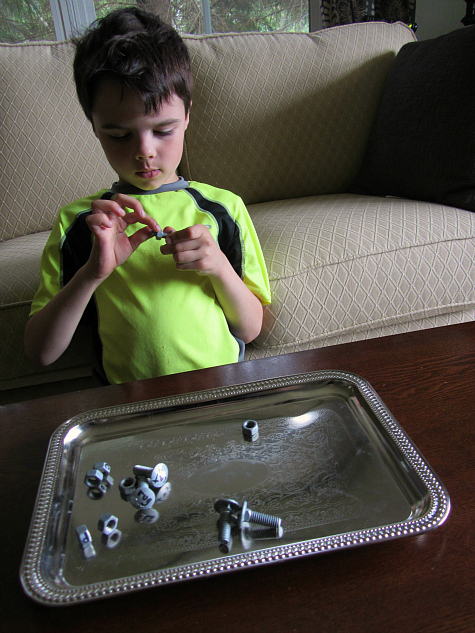 This is a great activity for those little hands that need to fidget while they learn. It can be hard to find things that boys really get interested in and this is a great one for that. I hope you don’t mind but I am going to include a link to this on my website http://www.buildingwritefoundations.com. Through my website, I try to help parents understand their children’s sensory “quirks”, the importance of a strong sensory system, and give activities on how to build that sensory system. This is a great one. Thanks! This is so great. We purchased nuts and bolts today. I painted the tops of the bolts with chalkboard paint and used a 1mm chalk ink marker to write the words so I can change them when my son needs to learn more words. Awesome idea! So fun!! I love it. I need NEED some chalk in markers. I am putting them on my list today. Great idea. Brilliant idea! Pinned this to my early learning board, perfect for my son as he gets a bit older! hi, your methods are very effective! I have an active 5 year old who LOVES to take things apart and is super curious about everything–I guess I can’t blame him, I too am a curious one 😉 My son has been taught the Montessori way since he was 3 yrs old. I see most of your teaching is VERY similar to Montessori learning methods, did Montessori methods influence your teachings in any way? Thanks for sharing your AWESOME teaching methods! I am not a trained Montessori teacher and I don’t follow all of Maria Montessori’s methods but they influenced my teaching style along with Reggio Emilia and Vygotsky. This is such an awesome idea! I did this for our daughter who start school in 2 weeks and wants to practice the nuts and bolts of spelling (you can see the pic on my pinterest board: http://pinterest.com/pin/545217098609314526/) Thank you so much for inspiration! Great Idea!! 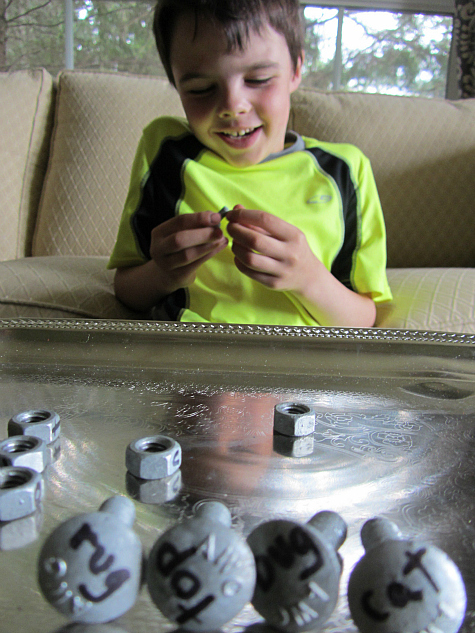 You could also add more letters to each nut so the child could just turn it for word family practice. B,C,F,H,M,P +at. 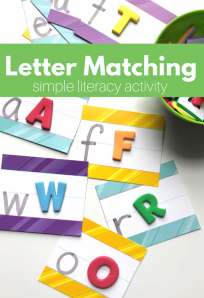 Once they get the idea that letters make words they can learn that words are connected. I LOVE this idea! Can you tell me what size bolts you used? Thanks! I need to check – hold tight and I will! Neat idea. Those look like galvanized fasteners, though, and in the fastener biz they always tell us to wash up after handling galvanized items, so I’d recommend playing it safe with stainless steel (if you can get the ink to stay on).